The Inventive Peasant Arnaud du Tilh had almost persuaded the learned judges at the Parlement of Toulouse, when on a summer's day in 1560 a man swaggered into the court on a wooden leg, denounced Arnaud, and reestablished his claim to the identity, property, and wife of Martin Guerre. The astonishing case captured the imagination of the Continent. Told and retold over the centuries, the story of Martin Guerre became a legend, still remembered in the Pyrenean village where the impostor was executed more than 400 years ago. 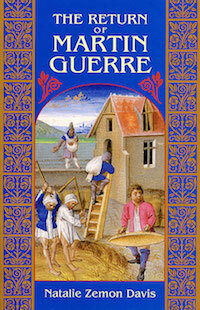 Now a noted historian, who served as consultant for a new French film on Martin Guerre, has searched archives and lawbooks to add new dimensions to a tale already abundant in mysteries: we are led to ponder how a common man could become an impostor in the sixteenth century, why Bertrande de Rols, an honorable peasant woman, would accept such a man as her husband, and why lawyers, poets, and men of letters like Montaigne became so fascinated with the episode. Natalie Zemon Davis reconstructs the lives of ordinary people, in a sparkling way that reveals the hidden attachments and sensibilities of nonliterate sixteenth-century villagers. Here we see men and women trying to fashion their identities within a world of traditional ideas about property and family and of changing ideas about religion. We learn what happens when common people get involved in the workings of the criminal courts in the ancien régime, and how judges struggle to decide who a man was in the days before fingerprints and photographs. We sense the secret affinity between the eloquent men of law and the honey-tongued village impostor, a rare identification across class lines. Deftly written to please both the general public and specialists, The Return of Martin Guerre will interest those who want to know more about ordinary families and especially women of the past, and about the creation of literary legends. It is also a remarkable psychological narrative about where self-fashioning stops and lying begins.